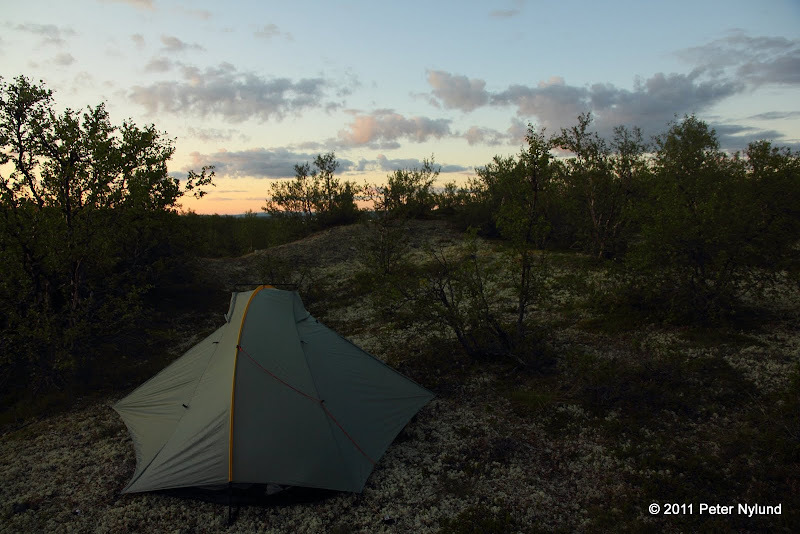 The Pöyrisjärvi trip started with a very good weather forecast and for once even a reasonable amount of planning. I had six full days of riding time as well as an evening with about five hours. 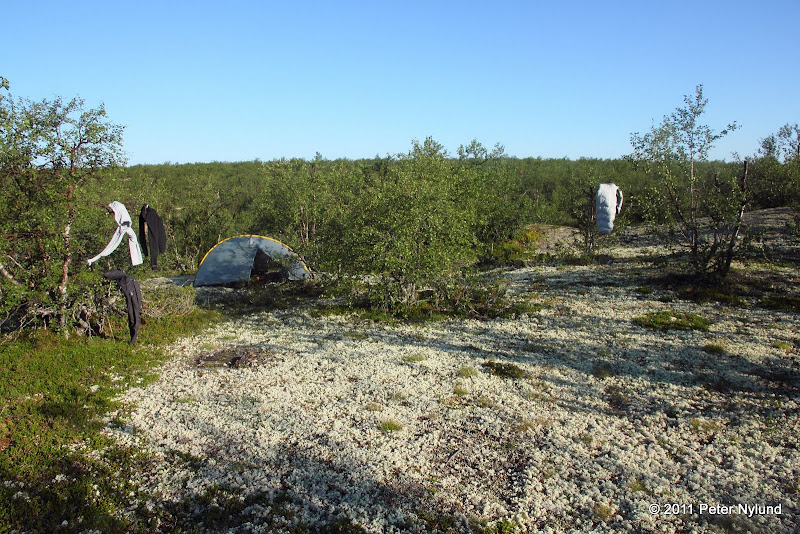 The route was pretty much clear, though I had only a vague idea about the terrain and hence had not planned any camp sites. On Friday I packed everything I needed, or at least thought I would need. I got uncharacteristically systematic this time and made a spreadsheet with exactly everything, including the weight of the items. Having a list of the items needed makes the actual packing of stuff a lot easier than otherwise, and I managed to not get too stressed about it. Around 19:30 I started riding to the railway station, maybe 7 km away, and got there in time. After two hours on the train I got to Tampere, where I got on the night train north. Since my last time on the night train the railway company has renewed the sleeping cabins with air conditioning and a little more space. I slept all the way to Rovaniemi, with some interruptions, where we arrived at 7:50 in Saturday morning. Now I had almost four hours of waiting until the bus further northwards would leave. I had hoped to eat a pizza before that, but it was too early in the morning to actually be able to get one. 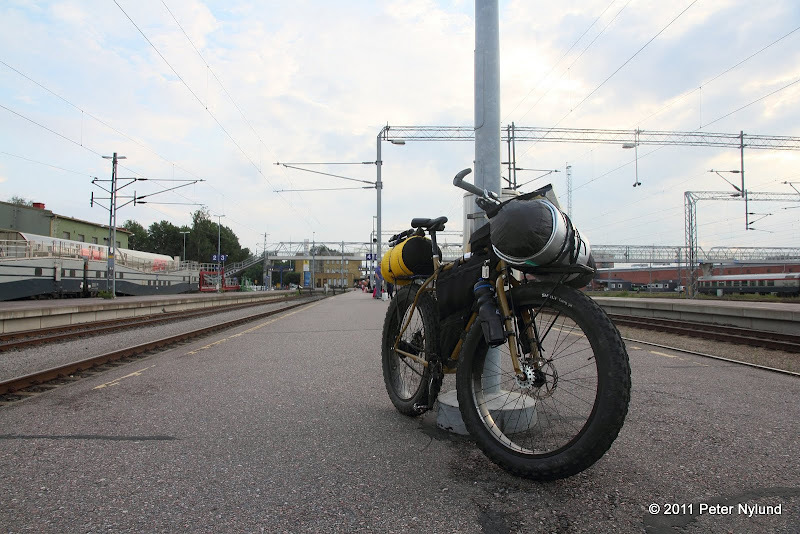 After riding through Rovaniemi downtown I returned to the railway station and waited for the bus. The bus left at 11:30 and took its time, but at least I got some solid advice about the route from Kare Eskola, who has lots of experience from the area. 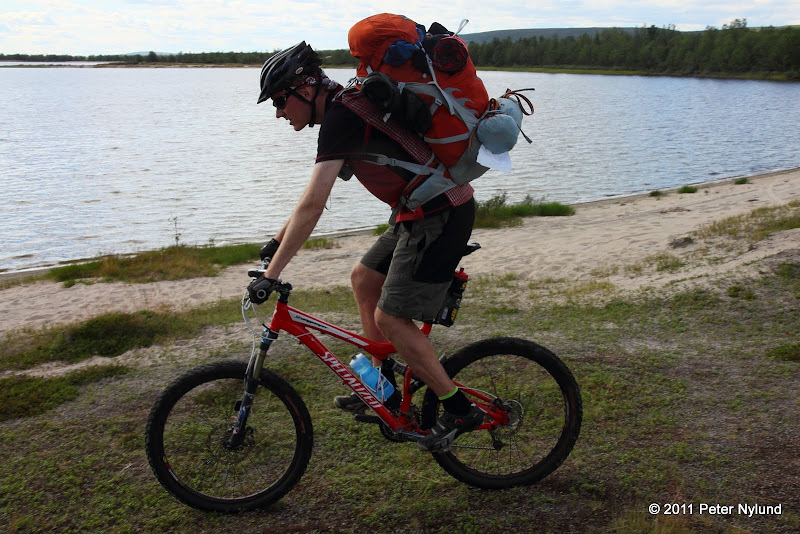 He was going to mtbSeikkailu 2011, a supported mtb tour in the region, featuring very hard riding. See Matti H:s write-up in Finnish for that one. At 16:30 the bus arrived in Hetta and after eating pasta with chicken at Café Silja I started riding. 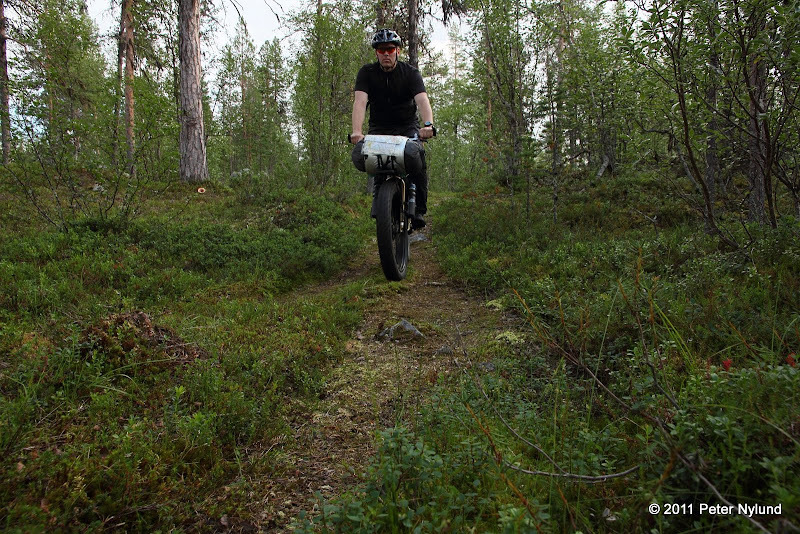 The route started through mostly sparse pine forests on a sand ridges. The front felt slightly heavy to steer at first, but I quickly adapted to it. I actually had more weight in the front drysack due to it containing all the food and some other stuff. For the next day I packed it slightly differently to even out the weight between the front and back drysack and then I no longer noticed anything odd with the steering. 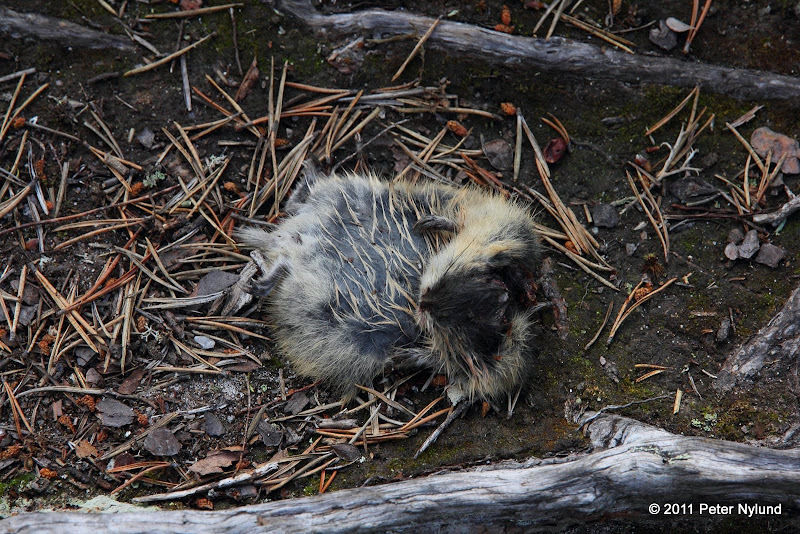 It took less than a half hour to encounter the first dead lemming (Lemmus lemmus), a very common sight during the trip. Some singletrack. 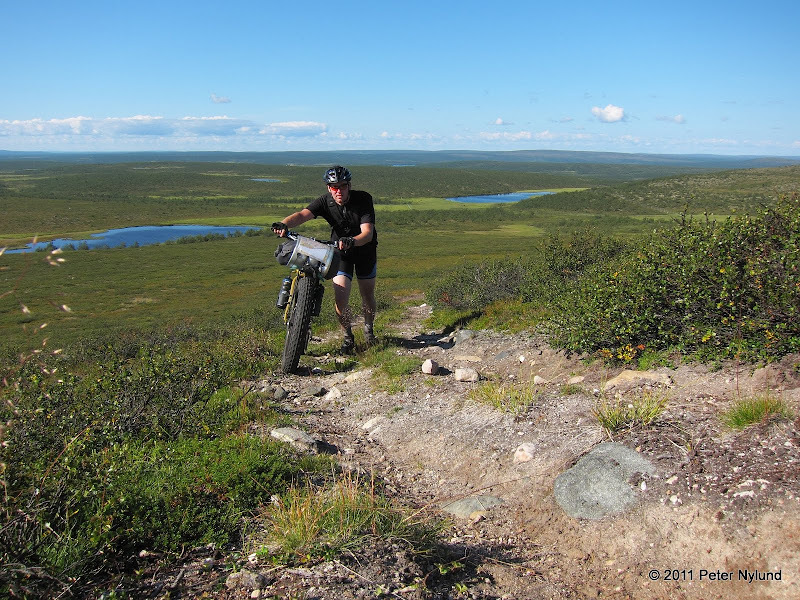 Most of the trail was ATV double track, ranging from being almost a road to being just some mud tracks in the bog. Occasionally it was rocky enough to be technically quite demanding. Often it would have been just as easy to ride next to the actual trail. The gold of the bogs. I ate quite a bit of these. 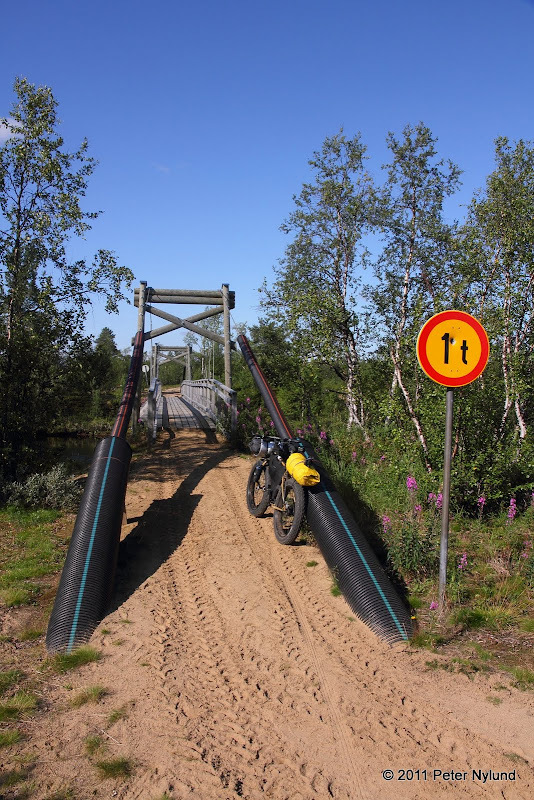 Boardwalk for ATV:s. One would think that it is easier to ride boardwalks with a fatbike, since the tire no longer fits in possible gaps between the planks, but the higher friction between the fat front tire and planks actually makes it harder to microsteer. 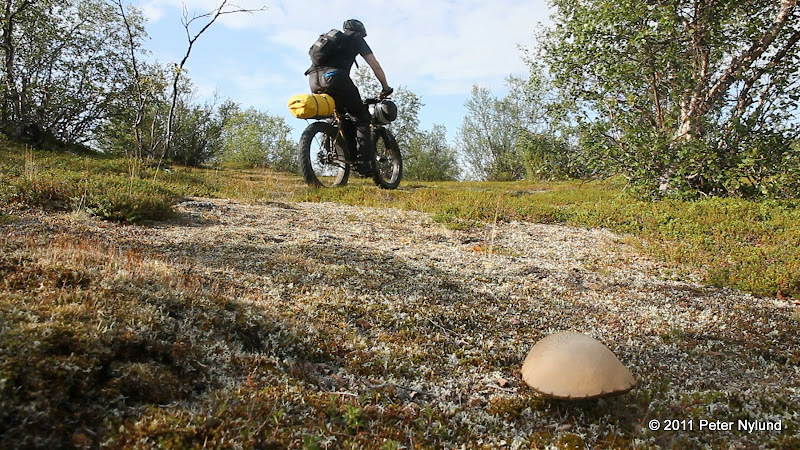 A fairly typical ATV trail. 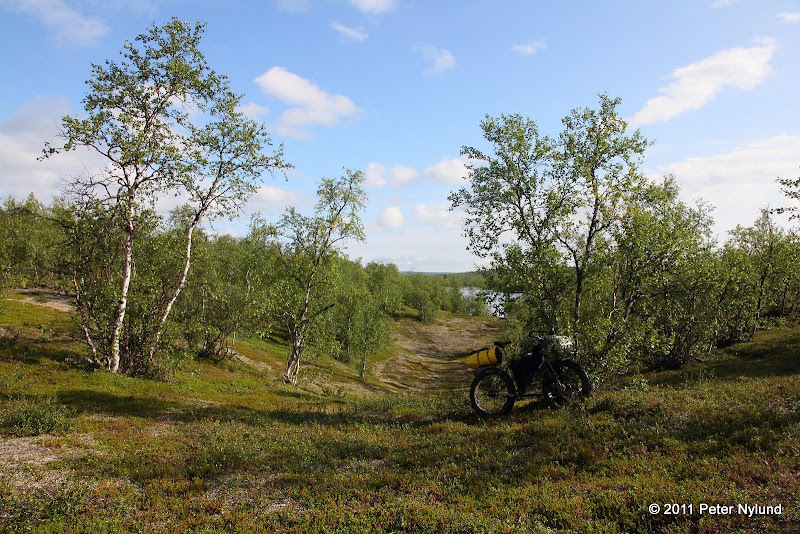 ATV:s are not allowed for recreational purposes, but the reindeer herders use them here. Näkkälän välitupa - an open hut between Hetta and Näkkälä. 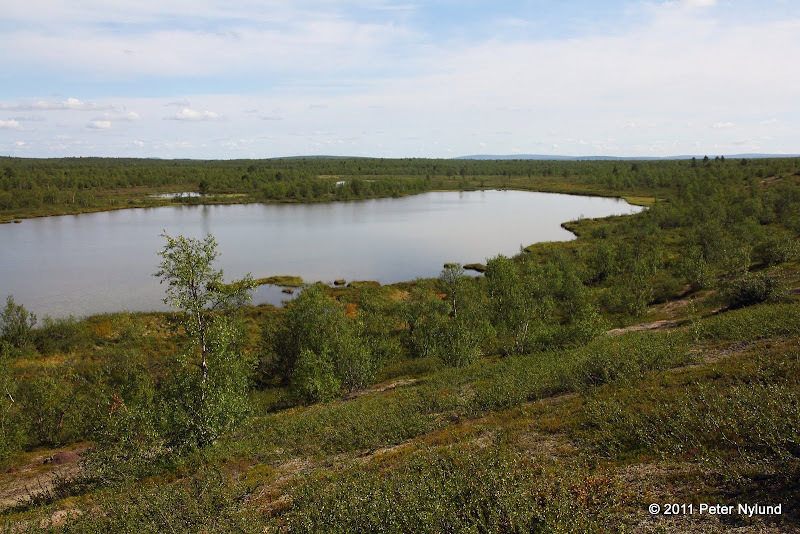 The whole area is a mix of bogs and sand ridges and hills, with some lakes thrown in between. 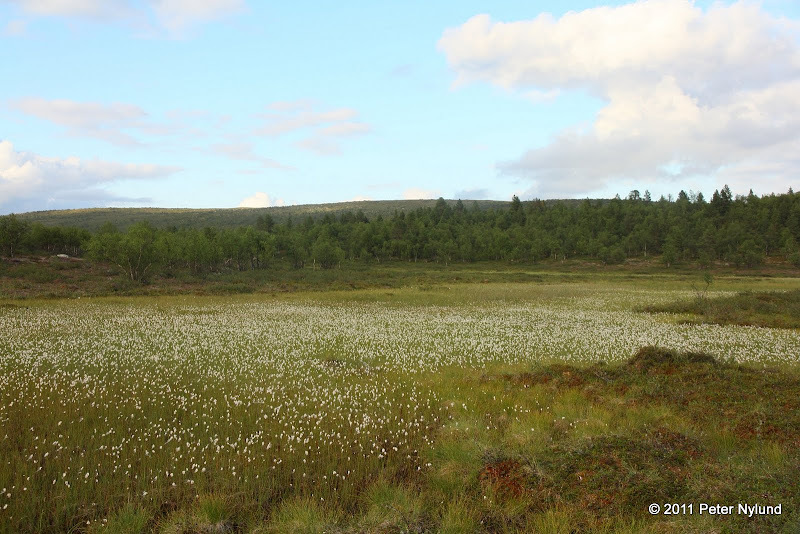 The common cottongrass was still white here. As with everything, it is a lot later this far up in the north. The riding continued. I ate some müsli bars to keep the energy level up. My feet were wet from a bog crossing that was not entirely rideable even with a fatbike. At one point a small stick jumped up into the rear wheel and as a result a spoke broke. I did not have a spare one (a big mistake), but I was not too worried about this. Still, I decided to make sure that I was not much more than a day of walking from the nearest road when the time to return would come. 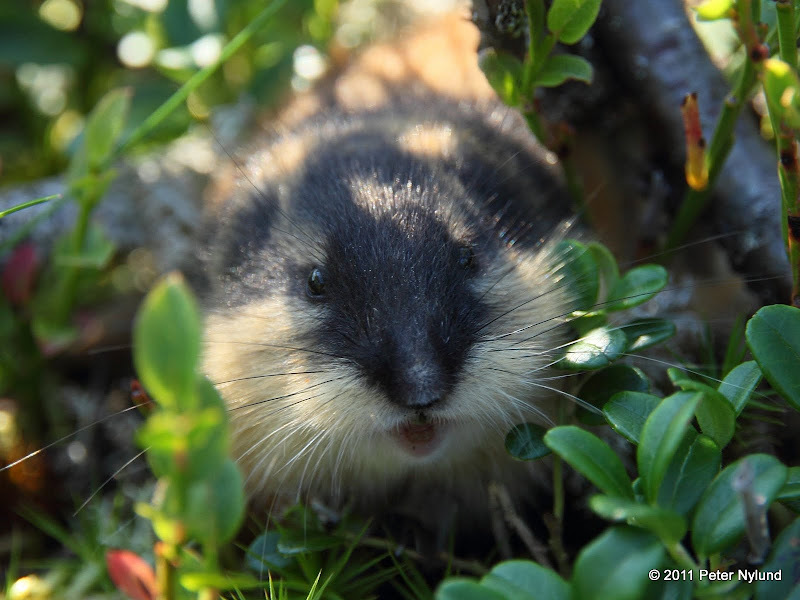 No shortage of live lemmings either. The first leg of the trip took longer than I had expected and I rode for over five hours before coming upon a good spot to spend the night. 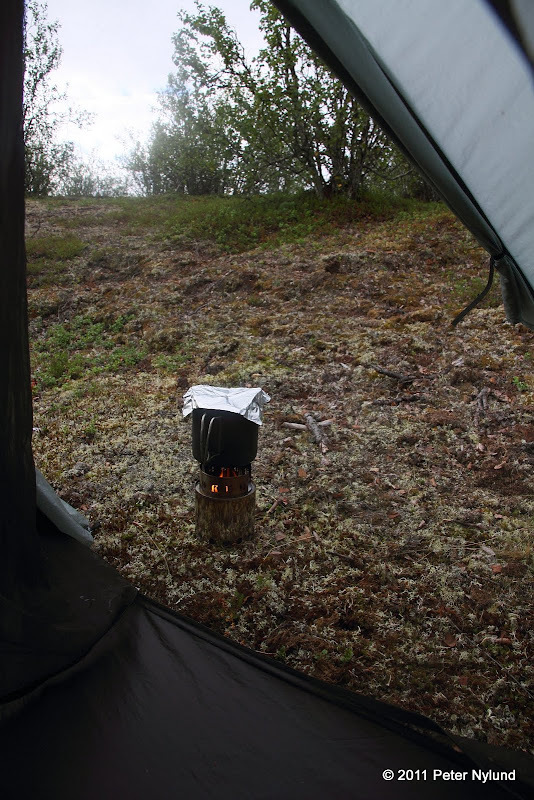 This time I did not make a dinner, since I ate just before I left and it was getting late (~22:30) by the time I had the tent up. I merely chewed on some beef jerkey before going to sleep. The night was warm with almost no wind at all and it did not get dark. Though the sun was below the horizon for four hours, it was just by a few degrees, enough to give a lot of light. 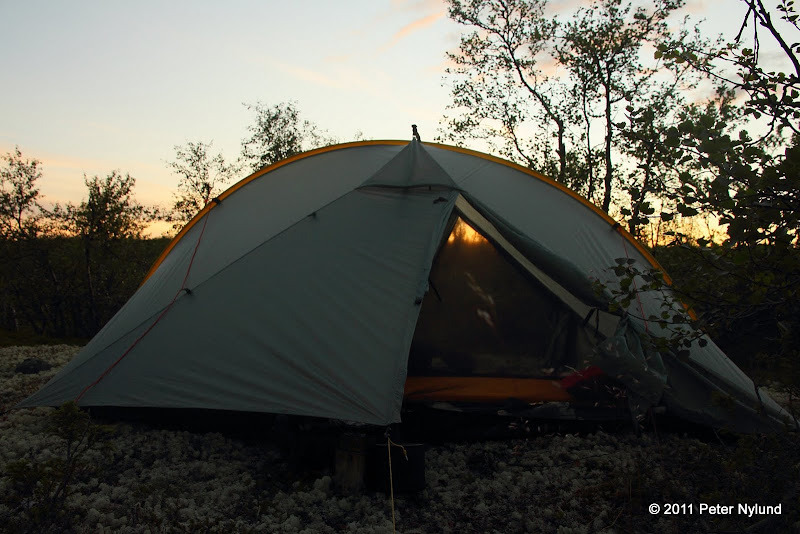 I slept well even with the lemmings squeaking around the tent and finally woke around 7:30. It was a nice Sunday morning. 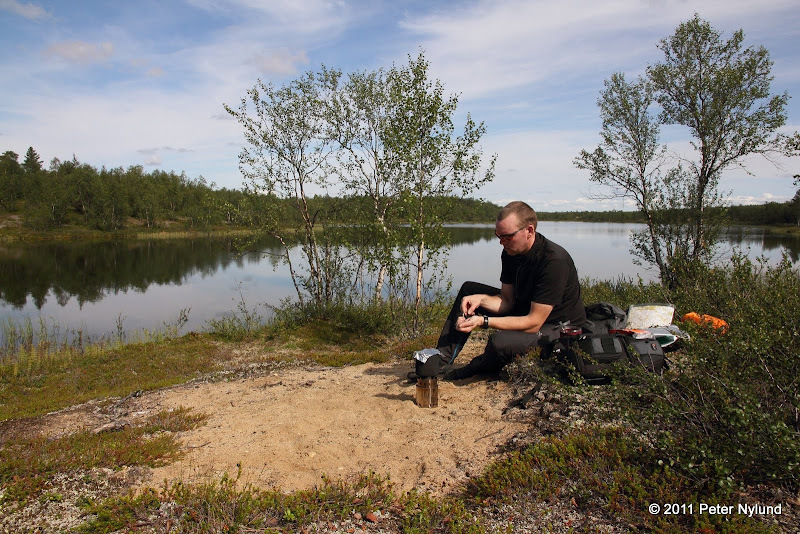 I had spent a few minutes after getting to camp gathering small branches and used it to boil water with the BushCooker for morning porridge and coffee. The camp in the morning. I got going again a little over nine in the morning. 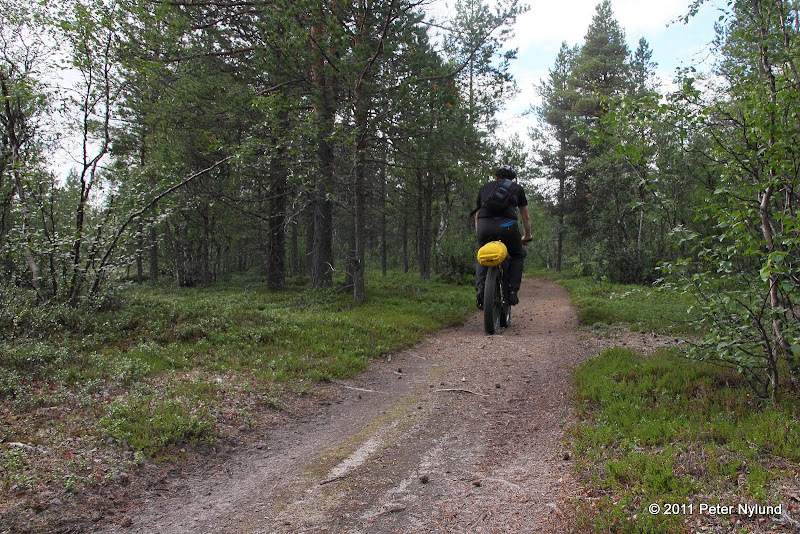 I started with some trail-less riding before going down to the road leading to Leppäjärvi. 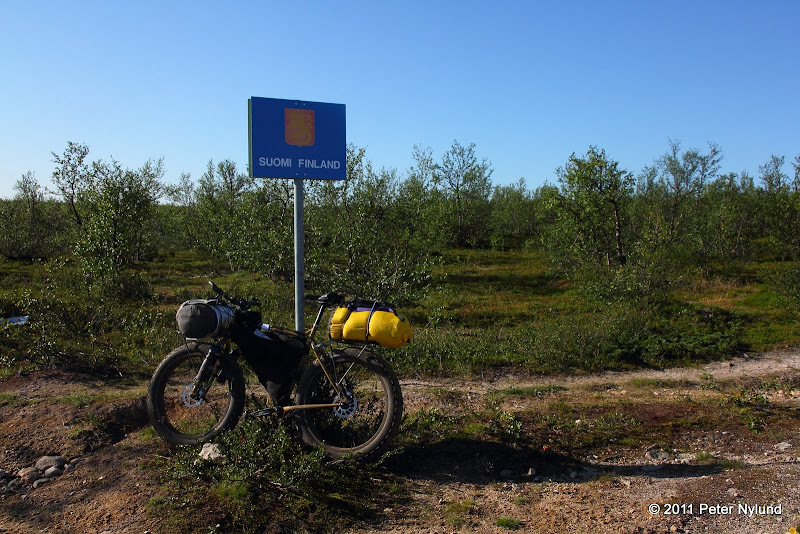 The road section didn't take too long and soon I neared the trail to Kultima. Before that I had to go through this gate, which hopefully was intended to keep reindeer out instead of cyclists. Crossing Palojoki on a bridge. 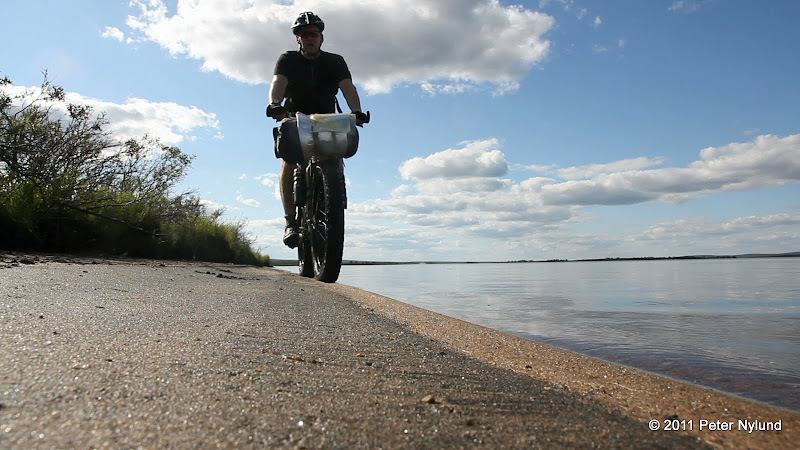 You'd need a packraft to cross this one with a bike. In places the trail to Kultima was very easy to ride. I took lunch a little earlier than I would have like to, since after this particular place there would be no good water source for a while. Some sections needed some planning to make sure that good water would be accessible, but my two bottles of one liter each helped the situation. There were lakes regularly close to the trail, but many of them were hard to access being surrounded by very soft bogs. A good lunch is preferrable followed by two cups of French roast coffee. 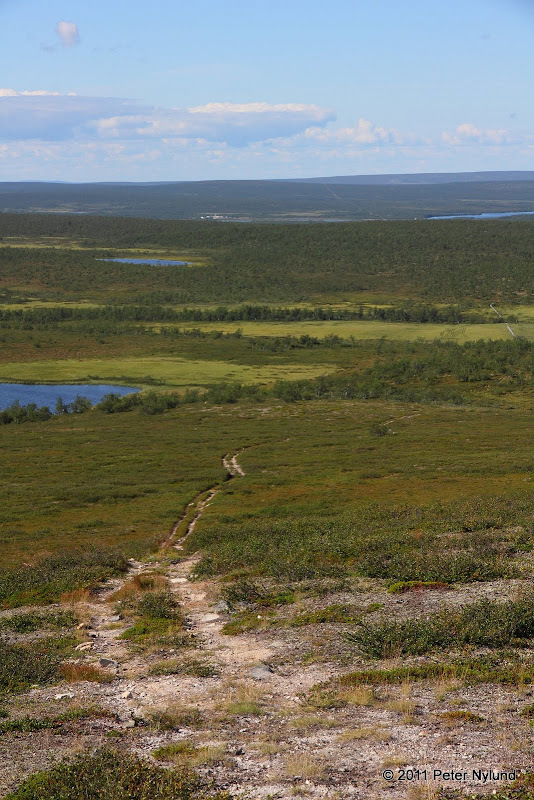 After the trail turned north towards Salvasjärvi from Kultima it became worse. Clearly it was too bad for some poor animal. 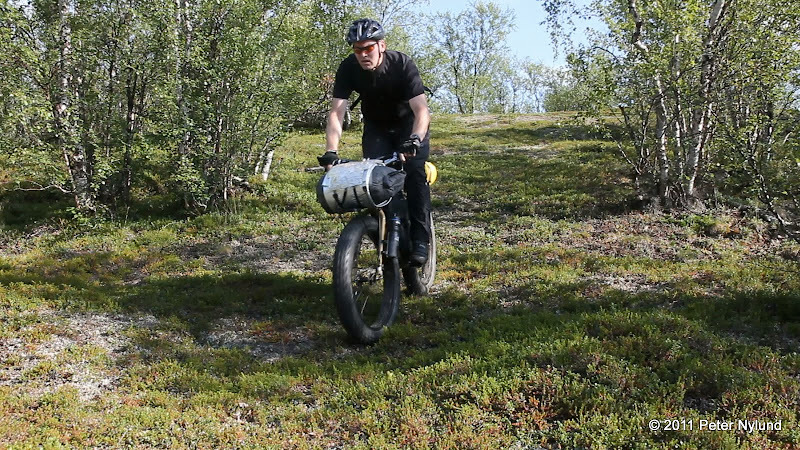 The riding was occasionally quite hard and it was a little too warm (20ºC, 68ºF) since there was no wind at all. At this point I also took notice of some noise from the bike. One source of the noise was the rear rack, where a screw was coming a little loose. It was easy to fasten and gave me no more problem during the trip. The second problem was the right crank, which also was coming loose. The reason for this was that I replaced the bottom bracket just before I left and while I did fasten it with about the proper torque, it usually needs retensioning later. My small bike multitool did however not allow enough torque to be applied, and I had to retension it every day for the rest of the trip. A slight miscalculation. Looking carefully at the map I should have seen that a short and wet bog crossing would have been possible. Instead I just followed some ATV tracks and found myself in a long and wet crossing. It was sort of rideable. With maximum effort the bike went forward and did not sink too deep. I repeated this 50 m at a time, resting at the occasional bushes and finally got over. The Saami village at Salvasjärvi. It is mainly used in the summer. Continuing northwards. At this point I was getting very low on energy and took an energy gel. Like in Tahko 180 km this turned out to be counterproductive. About 40 minutes after eating the gel I started feeling sick and started vomiting. After emptying my stomach of everything I felt better and could continue. I consider this to be the final proof that energy gels are not for me. By now I just wanted to stop at the first suitable place, mainly needing access to water. It still took some time finding one. I finally crossed a creek with a good tent spot close by and set up my tent. This was around nine in the evening after a fairly long day. It was interesting to see that as soon as the drive and concentration to move forward was no longer needed, I started to feel really weak due to having almost no energy at all. While setting up the tent I crawled on all four instead of standing up, since that felt too hard. I felt too sick to be able to eat any real food, so I just boiled some water and made blueberry soup (from powder). I drank it, slept for half an hour and felt good enough to start to take in some more calories in the shape of müsli bars and beef jerkey. The tent spot was still quite ok. I woke earlier on Monday morning and felt much better. 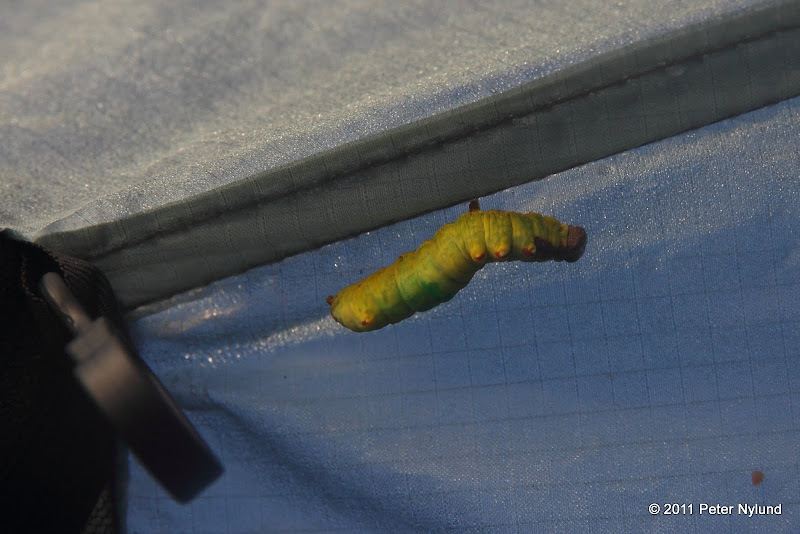 I even had company in the tent. Boiling 0.9 l of water again. Butter to increase the caloric content of the morning porridge. Airing out some stuff before leaving. I started a little over eight in the morning and soon entered my dear homeland again. The trail continued and was easy to ride. Unfortunately it went the wrong way, which I discovered after a while. That should teach me to pay attention to the map. 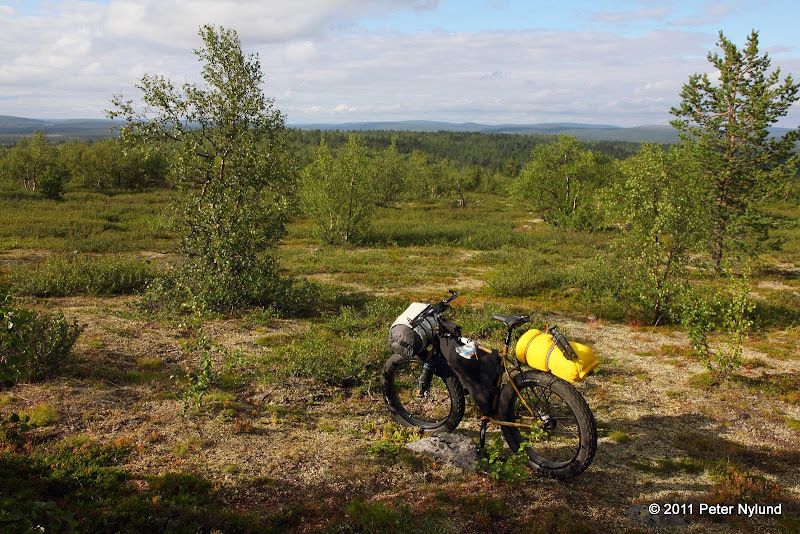 After a while I came to the Hetta-Kautokeino road and followed it for a kilometer or so before coming upon the trail eastwards. I now noticed that I had lost the ballhead of my tripod. The stupid thing had no real locking mechanism and probably unscrewed itself because of the vibrations and shaking. Bad design and also my fault for not recognizing the failure mode. This would come to restrict video filming and self documenting. 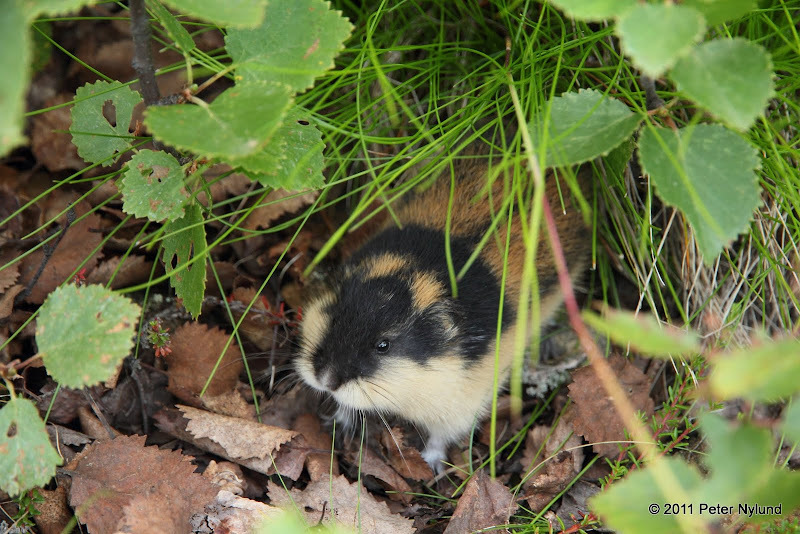 A lemming did not appreciate my presence on its trail. The boardwalk was not rideable in its entirety. ... as well as bike pushing. 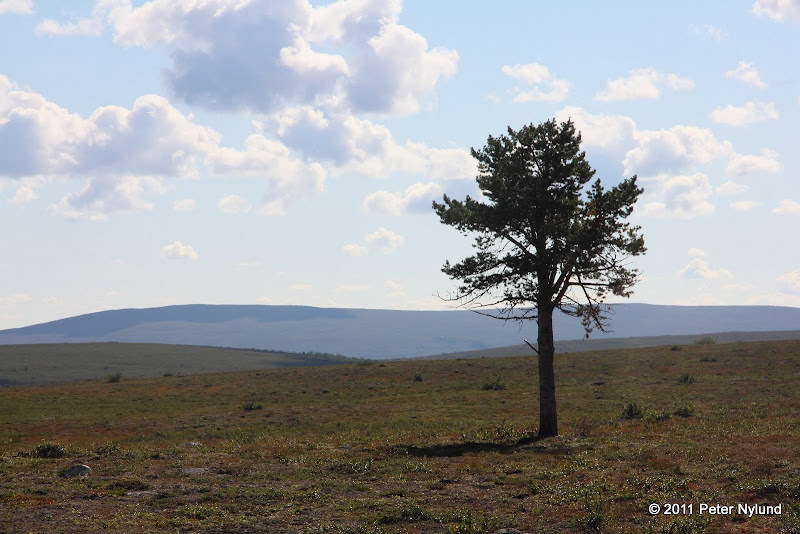 A poor lonely pine at the top of Spalloaivi. Easy enjoyable singletrack with a slight descent. This pine looks a lot better. I arrived at Kaamusjärvi just as Jackoja and his buddy (Jaakko if I heard correctly) were leaving. This was an excellent camp site and for that reason they did not continue until noon. From reading fillarifoorumi I knew I would run into them, since we had almost the same route the first days. I had seen their tire tracks the day before. Their backpacks look a little big and heavy. The lunch was a Real Turmat Cod Casserole, which was excellent. The trail continued southwards, where it joined the trail/road between Näkkälä and Pöyrisjärvi. It was not real road, but probably good enough for a real terrain car. A SUV would not come far on it, though. I continued towards Pöyrisjärvi, where I run into Jackoja and his buddy again. They had just eaten lunch. We shared the raft at Iiskonsalmi. 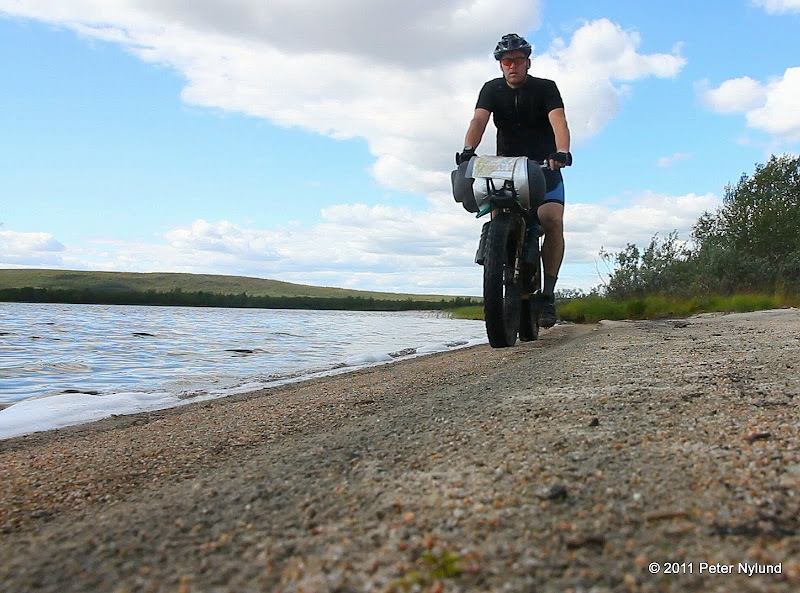 I then continued a little faster, since my fatbike was a little better suited to the in places rather soft ground. 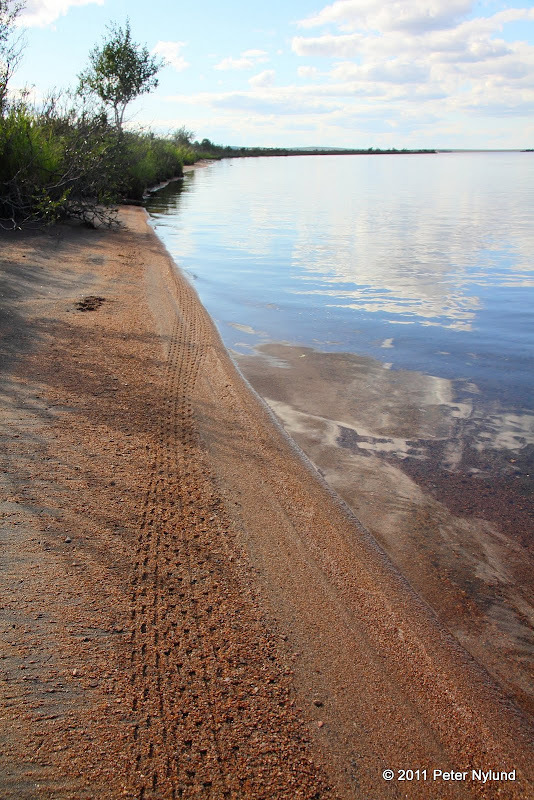 The Oivuksenranta beach, a narrow strip of sand between the Oivuksenvuoma bog and the lake. A little over 2 km of fatbike heaven. Part of it was under water, but I could still ride all of it. The soft bog started just a few meters from the beach. The beach riding was over for now. The beginning of the Pöyrisjoki river was easy to cross by going a bit into the lake, where the water was only knee-high. Looking back at the beach. If you look carefully, you can see Jackoja and Jaakko crossing Pöyrisjoki on the lake side. 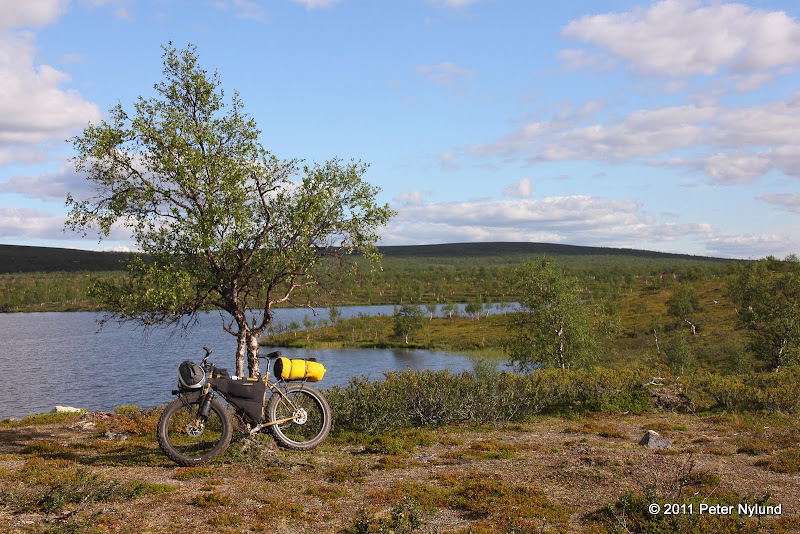 I continued towards Kalkujärvi. At one point there was an almost bizarre landscape with sand, grass and juniper. Again I started to get low on energy, but this time I avoided the energy gels and made a sport drink instead. The sport drink actually felt a lot better to drink than just water and I also think the body absorbed it better since it contained some sugar and electrolytes. This had again been a very warm day and I probably drank some eight liters of water during the day. At around seven o'clock in the evening I started to look for a suitable camping spot and a little under two hours later came upon this one. 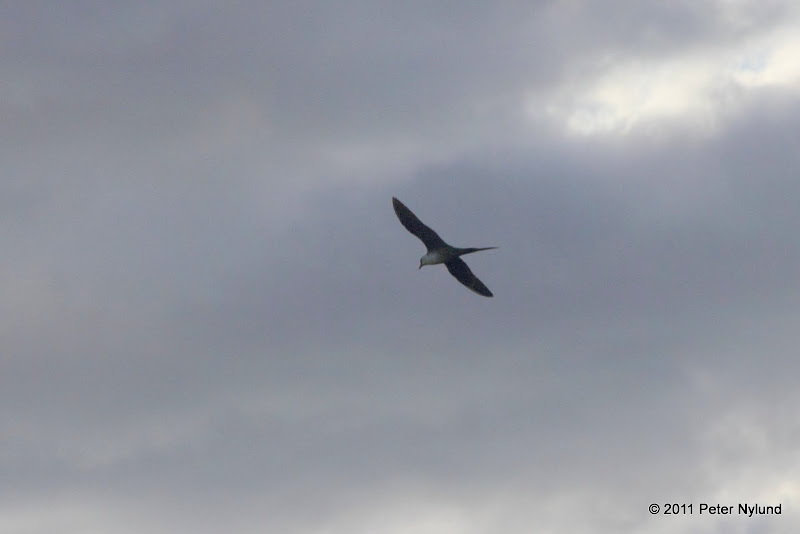 It was on a sand ridge and open enough to provide a good view. 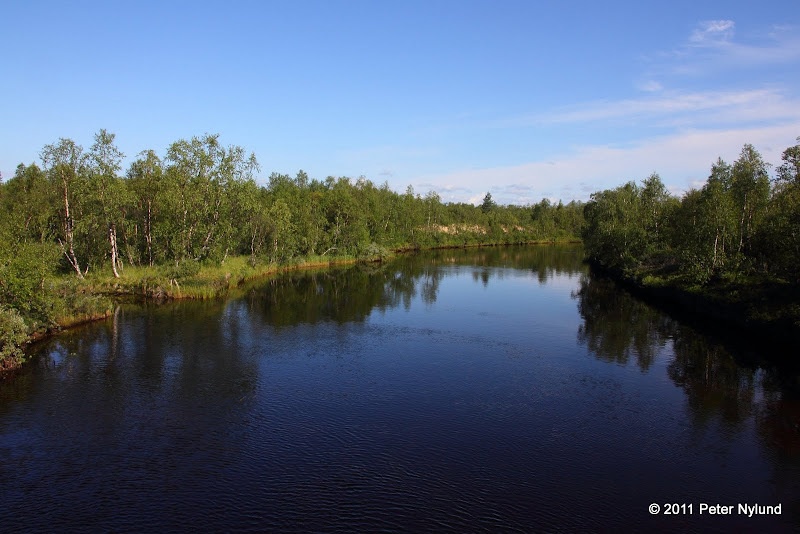 A creek was nearby and I took a refreshing bath in the Lappish jacuzzi (sit down in a cold stream). Again I had had a long day of riding, over twelve hours including less than two hours of breaks. I was tired enough to have trouble getting my dinner down, though I managed to eat all of it. 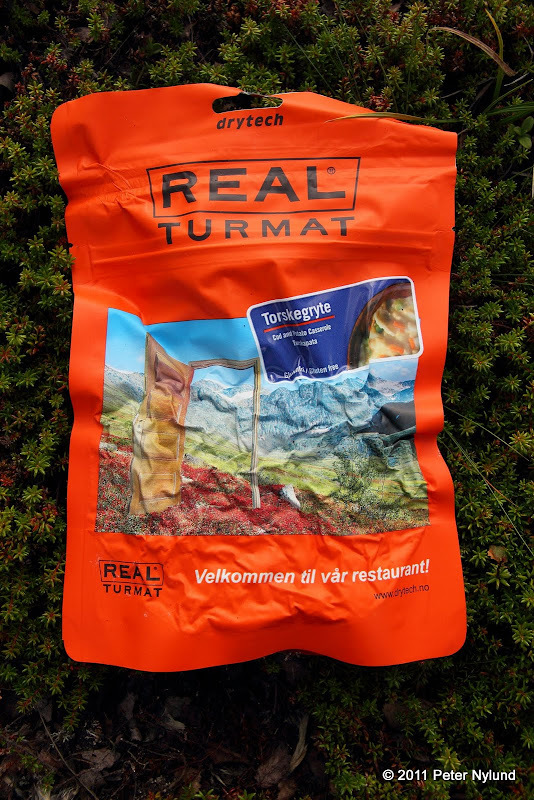 Good thing the Real Turmat bags keep the food warm for a long time. A cup of blueberry soup and a little beef jerkey helped keep the hunger away. Some twigs gathered for boiling water the next morning. Very nice description with superb photos! 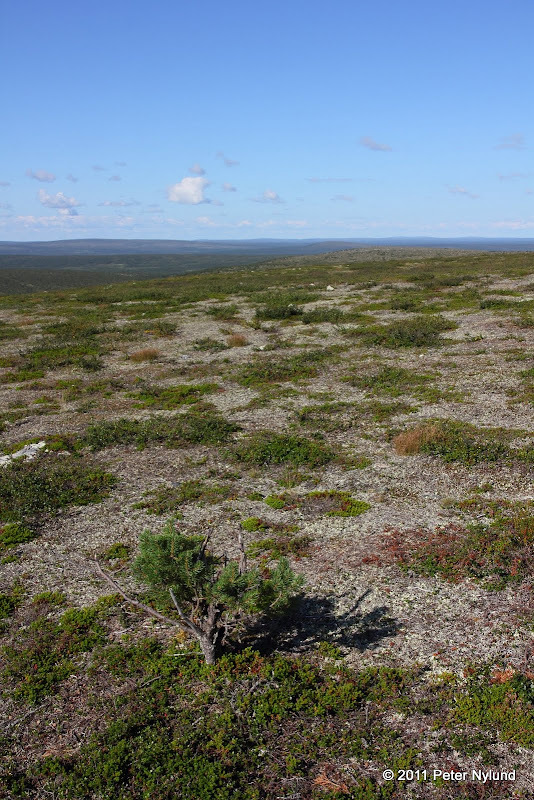 Scenery of North-West Lapland certainly beautiful. 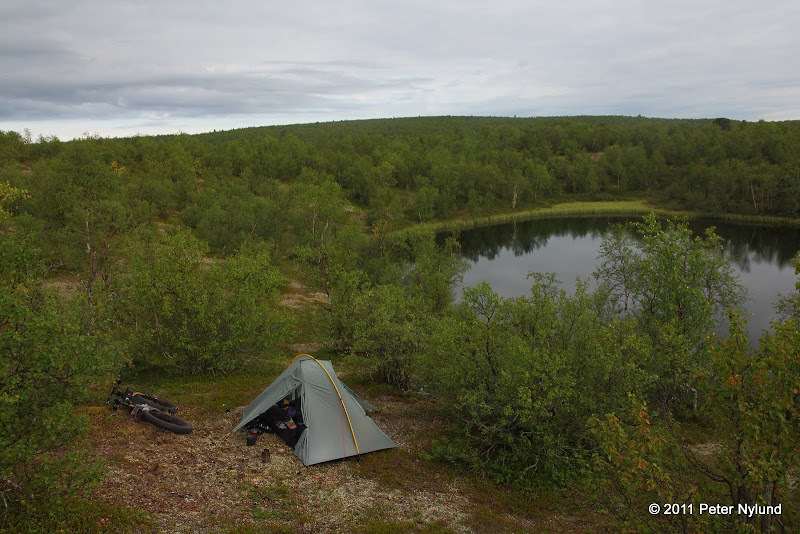 How did you come up an idea of that particular region for bikepacking (and your route)? 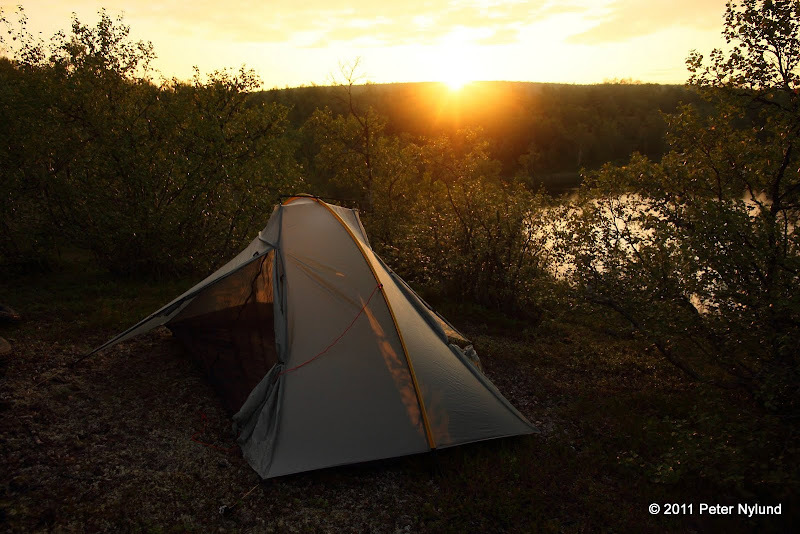 You did this trip during summer time, so how did you cope with mosquitos there? 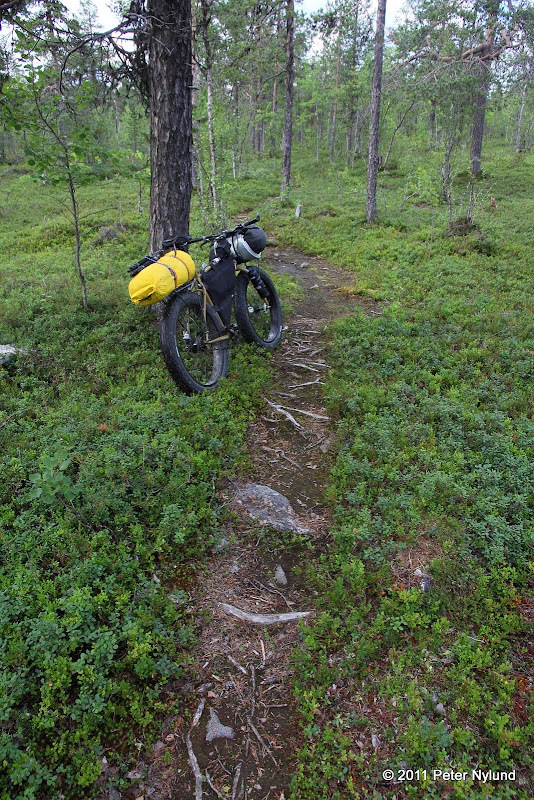 After reading your blog posts, for sure the whole bikepacking fascinates me a lot. 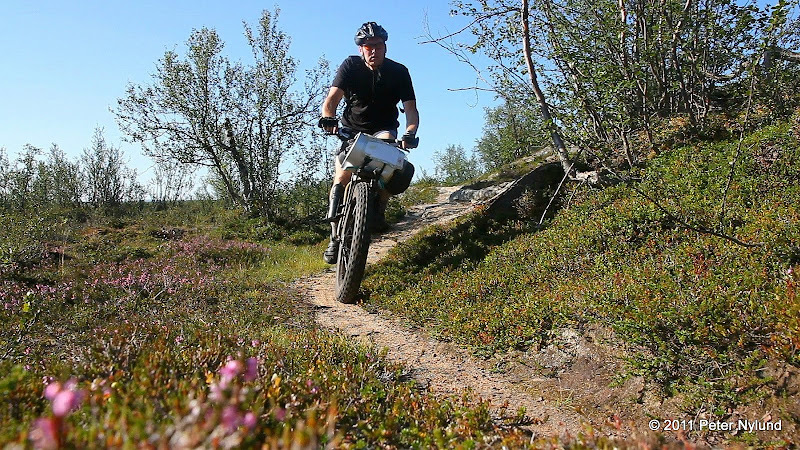 Haven't been aware of it much before (fat biking itself but also such a small and lightweight gear), but your posts put me seriously thinking of it! Looking forward of your latter section, worth waiting for. I totally forgot to mention the bug situation, but will do it in the next part. In short, there were very few mosquitoes. 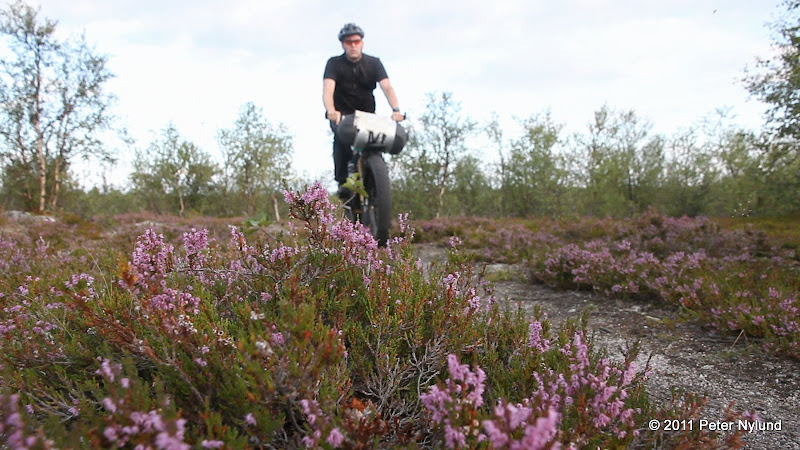 On a few places, some sort of midges bothered me and forced me to wear bugproof clothing (wind trouser and wind jacket). 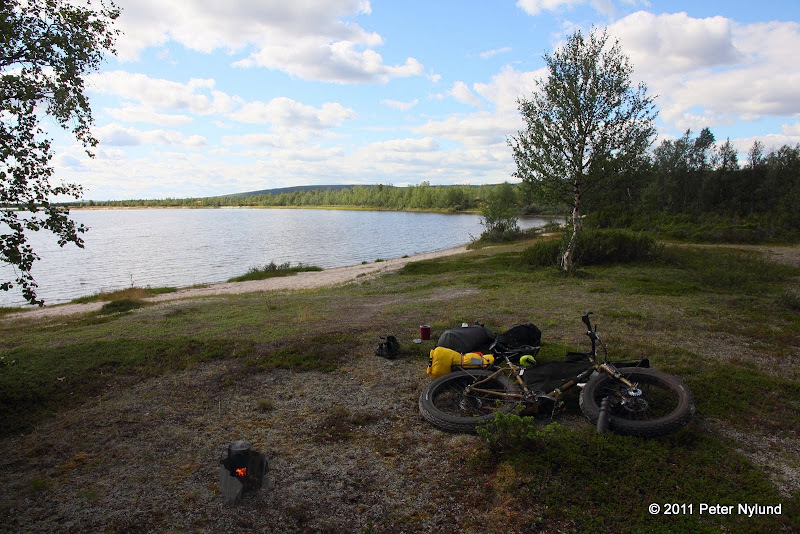 The Pöyrisjärvi was great and very suitable for bikepacking. 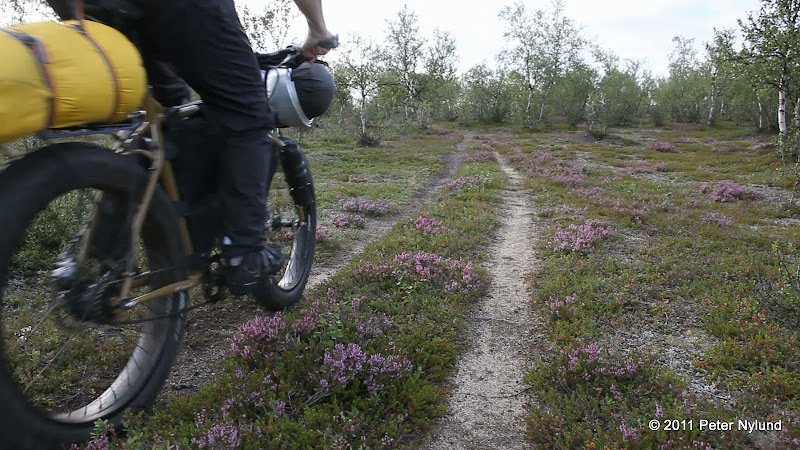 It was described in the fillarifoorumi forum as being a mtb heaven, and hence I started looking into it. Nice post! Really waiting next one! 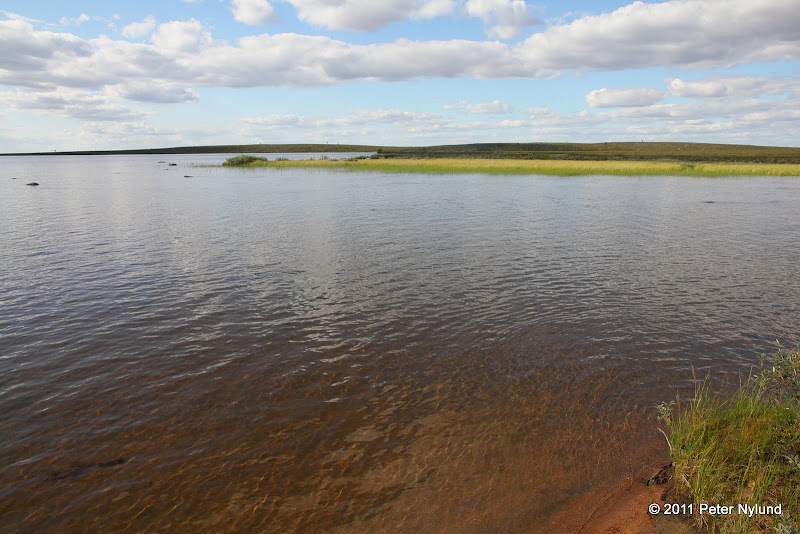 It seems that the water level of lake Pöyrisjärvi has decreased almost half a meter after I was there. Anyway must get back soon! Brilliant! Did the trip feel physically harder than what you expected? Toni, it was about what I expected. And it was my own decision to do some long and hard days. Fatties surely worked nice in those conditions. What was the weight of your setup? I haven't added any weights yet, but plan on doing it for the third installment. 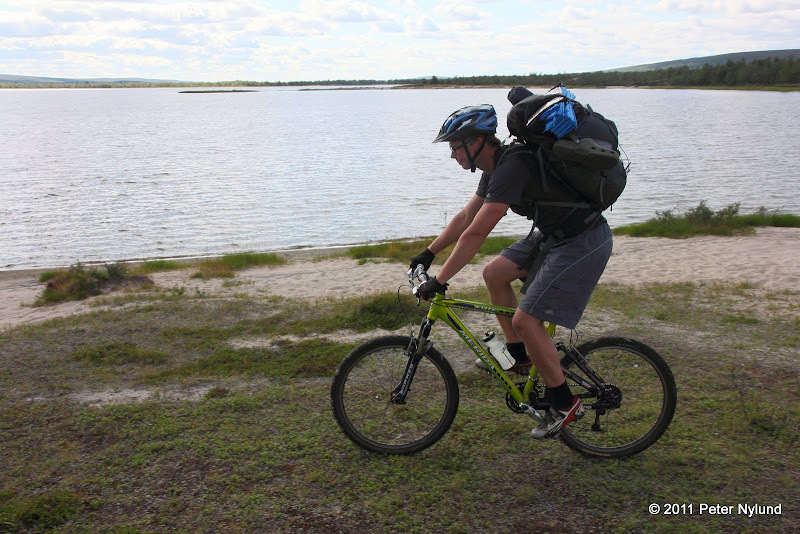 The bike including racks and frame bag is quite heavy at 19 kg, but the rest of the gear is mostly light. Including food for a week I would guess the rest of the gear weighed maybe 11-14 kg. Nice start to the report, looks like splendid weather and great riding. Video of the D60 looks good! Great post and very nice photography as well. Superb! !